Hugh Jackman has been treated for skin cancer for a third time. The 46-year-old actor was recently pictured with another bandage on his nose and his representatives confirmed to E! News he has been treated for Basal Cell Carcinoma (BCC). Hugh Jackman’s representatives say he’s “all good” after the procedure. BCC is a slow-growing skin cancer and is linked to sun exposure. It accounts for about 75% of skin cancers but rarely kills. Last night, Hugh Jackman tweeted: “Sunscreen” with a picture reference to Baz Luhrmann’s 1998 song Everybody’s Free To Wear Sunscreen. 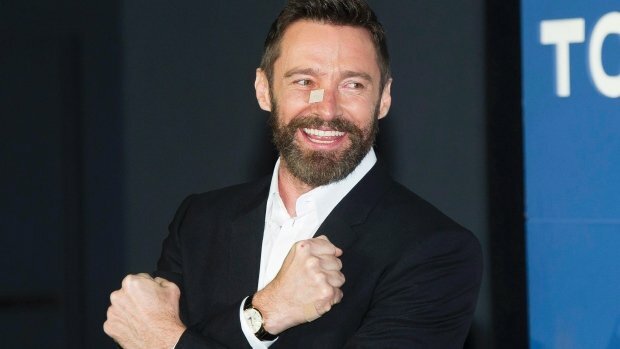 Hugh Jackman first revealed he was diagnosed with BCC in November, when he posted a picture of himself online after a similar procedure. At the time, the actor said his prognosis was good and pleaded with fans to stay protected from the sun. He then had more cancerous cells removed in May. Hugh Jackman has recently said he believes he’ll have many many more scares but claims it’s the most “minor” of all the skin cancers. His wife, Deborra-Lee Furness, first persuaded him to get the mark on his nose checked by a doctor. Surgery is the main treatment for BCC. If left untreated, it doesn’t usually spread to other parts of the body, but it can damage or disfigure surrounding tissue.